Used for meditation, or prayer, the mala is a beautiful piece of jewelry and a functional way to chant. 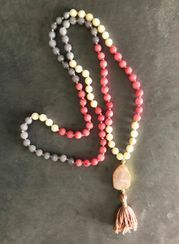 108 beads, thought to be a significant number for many reasons, but one that we really love is that the chakras are the intersections of energy lines, and there are said to be a total of 108 energy lines converging to form the heart chakra. One of them, sushumna leads to the crown chakra, and is said to be the path to Self-realization. No matter how you use your mala, it's a little piece of art to love!